Editor note: Hiller’s long-time artist Alec Voggel at Airxess contacted us and let us know we got some of the timelines wrong on Hiller’s masks, so it’s been updated to correctly reflect that. Enjoy the added accurateness! After spending the past seven seasons with the Ducks, Jonas Hiller gets a fresh start for the 2014-15 season in Calgary, and we all know a new team means new gear (well, most of the time). In his career with Anaheim, Hiller has sported some of my favorite and some of the most unique masks the NHL has seen, so while we await the reveal of his new Flames bucket, lets take a look at some of Hiller’s best masks from his time in SoCal. Back in 2010, when Hiller got the nod to represent Switzerland in Vancouver, I had no doubt he’d be sporting a slick new mask for the Olympics. Hiller’s long-time artist Alec Voggel at Airxess is known for his graphic aesthetic, which was executed perfectly on this bold mask design. The use of the Swiss cross as a design element, both to create a pattern across the chin and to frame the landmarks on each side, is a refreshingly innovative way of incorporating the nation’s identity in a way we haven’t seen before. The narrow sans-serif type across the front balances nicely with the heavy graphics on each side, as do the tapering metallic crosses around the chin. 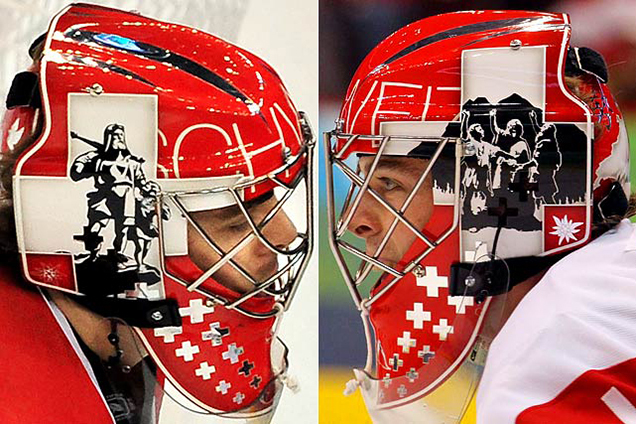 While the Swiss may not have left Vancouver with a medal, this mask certainly won gold in my book. We all know November (aka “Movember”) as the time of year when hockey players get to have a little fun with facial hair and support a good cause. Goalies get to have some extra fun in creating special masks to spread the word and show off their sense of humor. The Ducks’ netminder seized the opportunity in November, 2011 to poke some fun at his teammates (and himself) for a good cause. 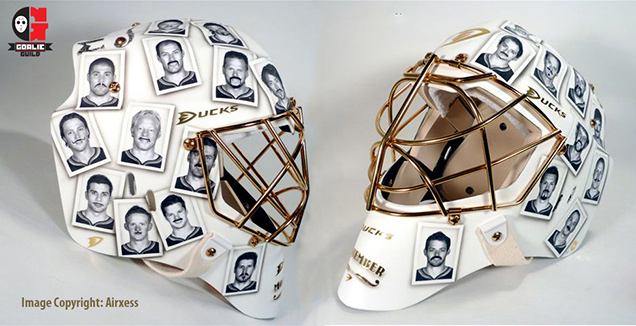 In Voggel’s clean, simple style, this mask is covered by basic snapshots of his Ducks teammates collaged around the helmet –– each with a mustache playfully drawn on. 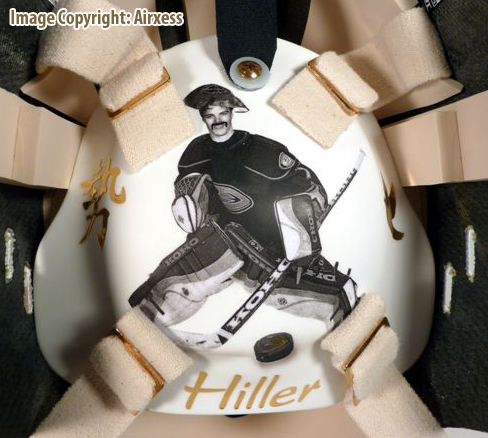 Not to be left out of the fun, the backplate features a photo of Hiller himself in full goalie gear sporting a marker mustache of his own. While the concept of this mask may not be as innovative or artful as others, Hiller and Voggel took advantage the opportunity to have some fun and executed the concept perfectly. In the 2012-2013 season, Hiller went rogue from the overly detailed, flashy mask trend sweeping the league and sported a solid, matte-black lid with metallic gold cage and tiny golden D in the center. 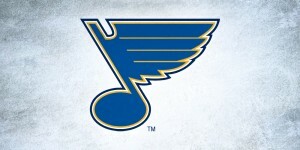 While the design (or lack of) certainly got mixed reviews (can “murdered-out” ever really be used as a compliment…?) 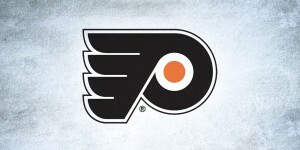 the slickness and simplicity added some extra intimidation-factor and in a way, gave us a sneak preview the next season’s design. 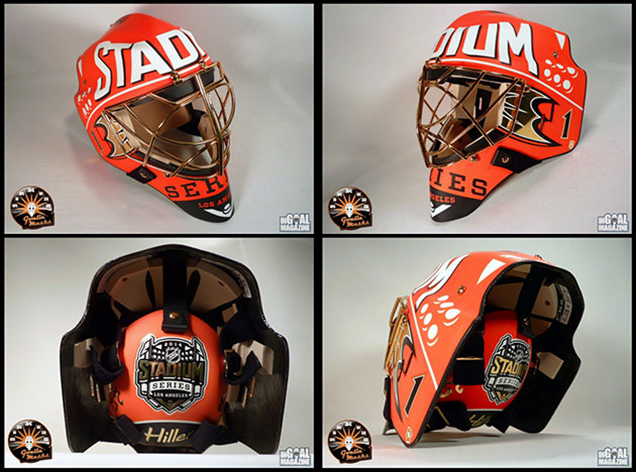 Hiller’s 2013-14 mask is without a doubt one of my all-time favorites. 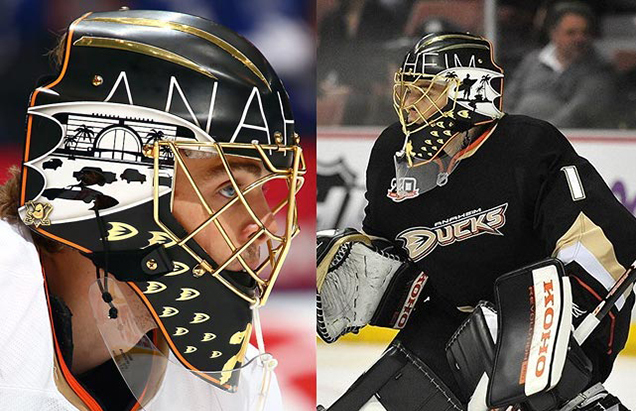 Following on the solid black “abyss” helmet, this design was playfully dubbed by Buzzfeed the “Anaheim School of Architecture and Design” mask (but since when is Buzzfeed an expert on goalie masks anyway?). The first time I saw photos of this mask, I was immediately blown away. 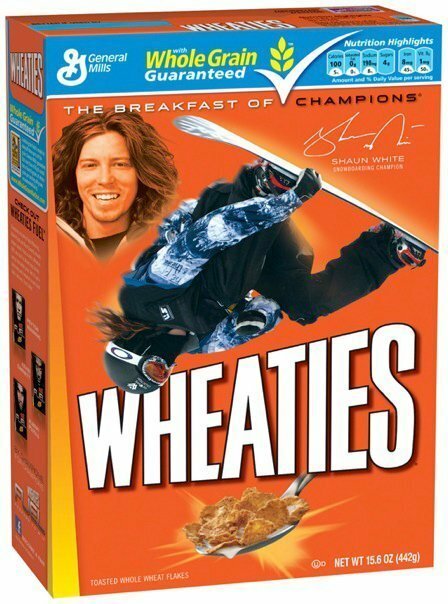 Ok, so maybe the internet trolls made the Wheaties box joke one too many times, but as with all of Voggel’s masks, clean lines and simplicity are sometimes underappreciated. 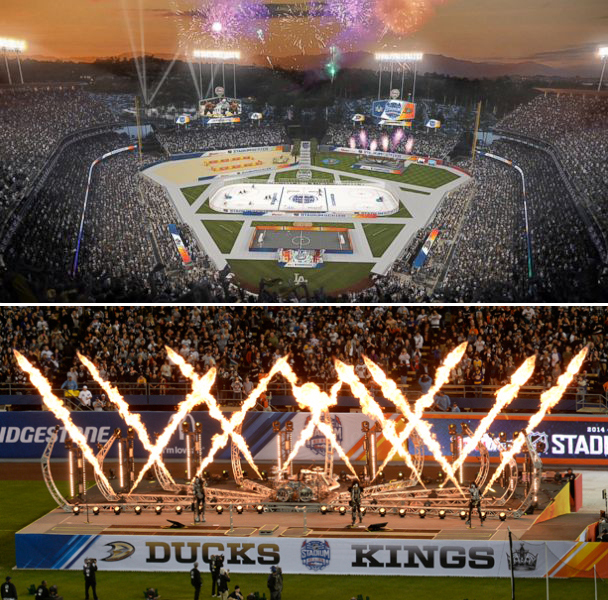 Under the same logic as to why Corey Crawford’s regular season mask didn’t work for the Stadium Series game, this design is perfect to view from the nosebleeds at Dodger Stadium. Even among the glitz, flash and pyrotechnics on the field that night, Hiller’s fluorescent and metallic gold mask was a showstopper. 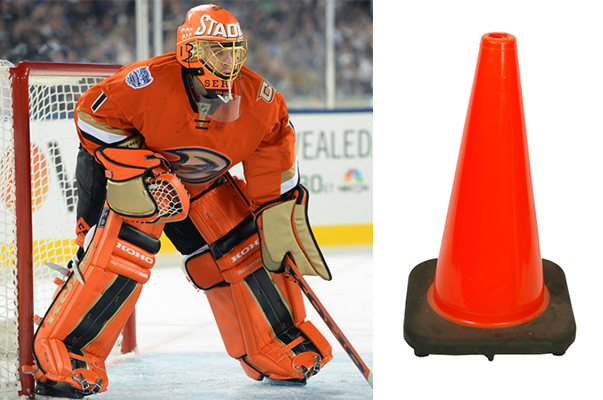 Unfortunately, there may have been some miscommunication, as the Ducks’ jerseys were equally as fluorescent…and so were Hiller’s pads, adding up to an one very orange traffic-cone look. However if we only look at Hiller from the neck up, this mask was thoughtfully and beautifully executed – perfect for the big stage. In addition to the 4 masks above, Alec Voggel and Airxess have created many other beautiful masks for professional and amateur goalies alike. To see more of his work, check out the gallery pages on the Airxess website. Agree? Disagree? What do you think is Hiller’s best bucket? 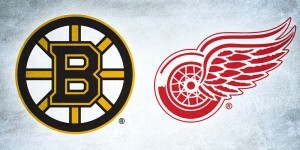 Any other goalies you’d like to see featured in this series? Let us know in the comments below!